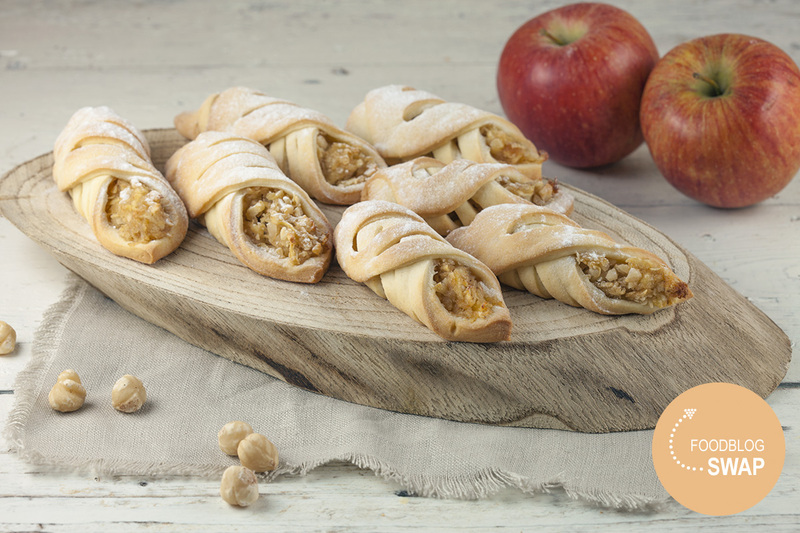 Turkish apple cookies, have you ever saw them? They're pretty, don't you think? But most of all they taste amazing! Made with a fantastic dough. Start with the dough, you can use a standmixer or knead the dough by hand. All you have to do is COMBINE all the ingredients listed until you’ve reached a dough ball. The dough should feel soft, but not too sticky. WRAP the dough with cling film and refrigerate for at least half an hour. 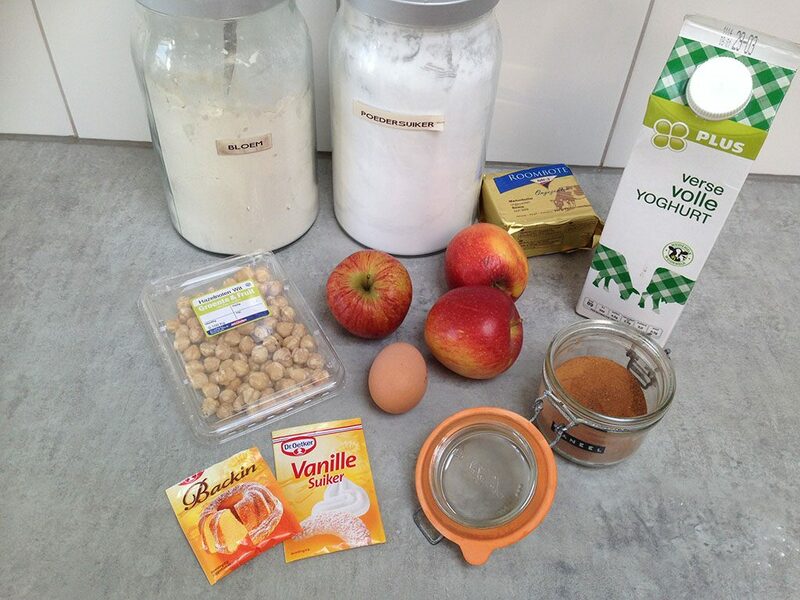 Meanwhile create the apple filling. Use a small blender to finely CHOP the hazelnuts, but make sure it still has a bit of texture. PEEL the apples and remove the core. Use a coarse grater to grate the apples into the small pan. HEAT the apples on medium heat, when they start to lightly bubble turn down the heat. ADD sugar and cinnamon and let it simmer for a few minutes, until most of the moisture has evaporated. ADD the chopped hazelnuts, you’ll notice they will absorb most of the leftover moisture. But to make sure it’s all gone, place the filling in a small sieve en press it downwards. PLACE the filling inside of the sieve in the fridge until it’s completely cooled off. REMOVE the dough from the fridge, it should be firm and cold by now. DIVIDE into 5 equal parts and DUST your work surface and rolling-pin with flour. 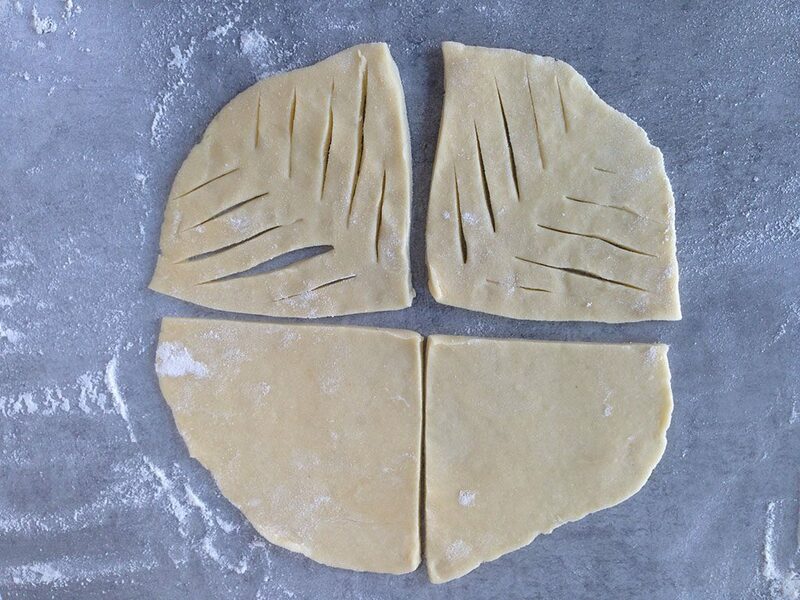 ROLL out the dough, but not too thin. 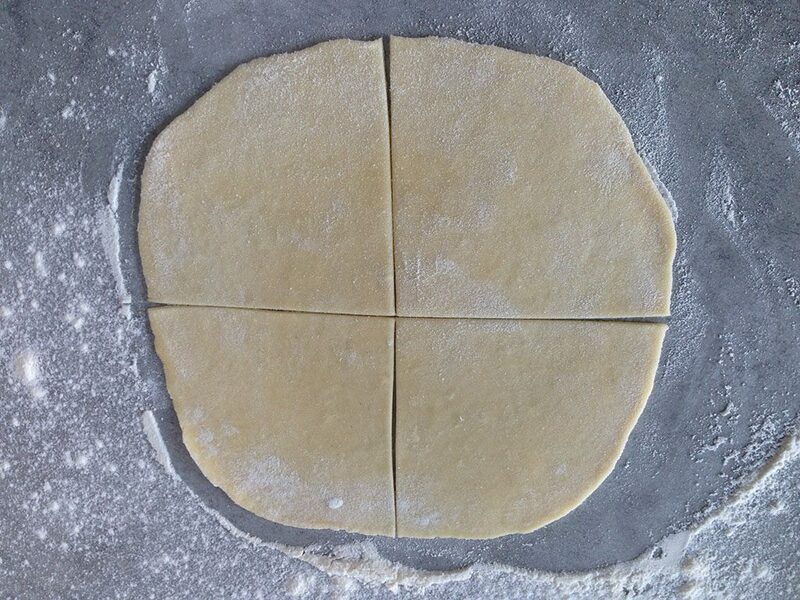 SLICE into 4 equals parts, and make incisions into the dough as shown in the pictures. 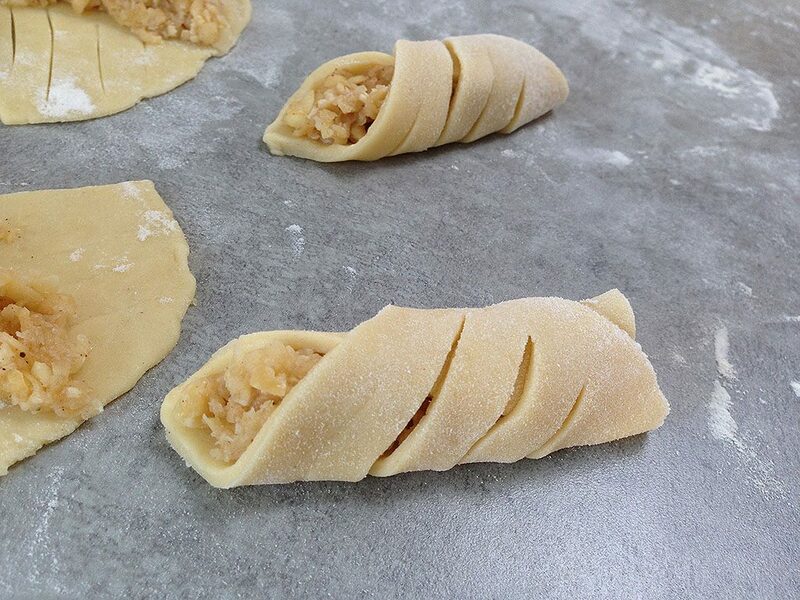 DIVIDE a spoonful of filling in the middle of the dough and close the packages, as shown in the pictures. PLACE the packages onto the baking tray and REPEAT until all the dough and filling had been used up. 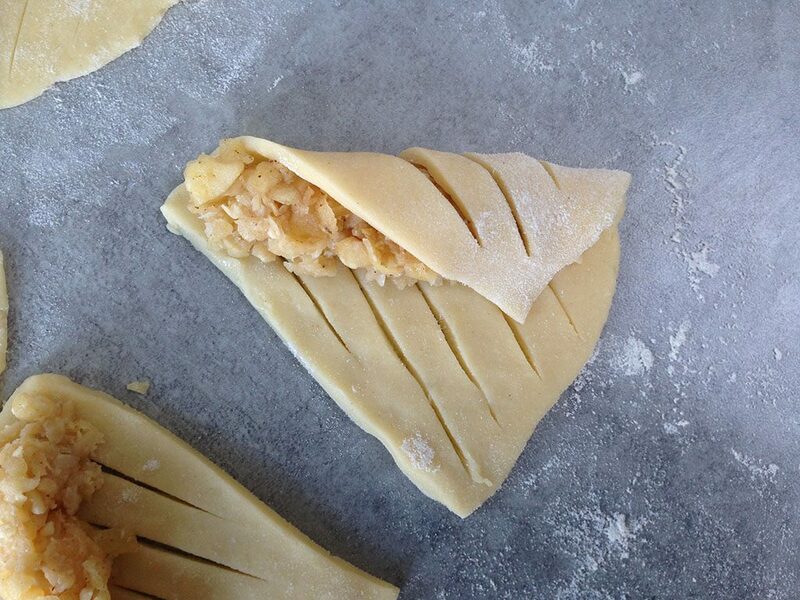 BAKE them in the oven for about 20 minutes, depending on your oven. 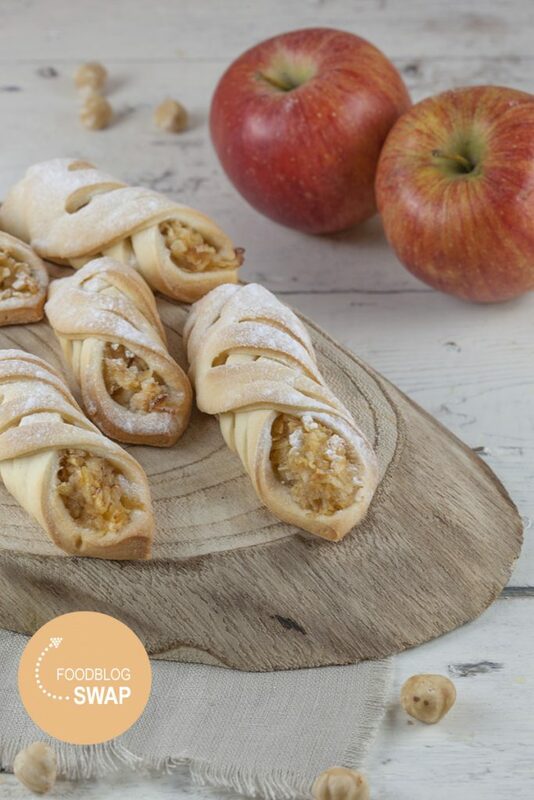 Let them cool off slightly, DUST with powdered sugar and enjoy! 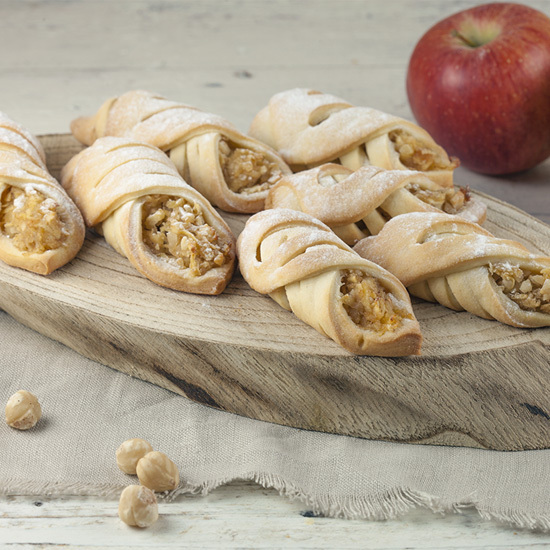 Simple apple filling but the presentation makes it very special.